We believe MGFBC exists to..
CONNECT individuals with God and a family of believers through worship, prayer, and fellowship. We believe relationships are important. First, that we have a personal relationship with God and then strengthen relationships within our church, families, and our community. GROW together in knowing God’s Word and applying it to our everyday lives. We believe becoming a disciple (Christ follower) is about discovering His truth, promises, and power as we dive deep into His Word. Great things happen in small groups. Join one today! 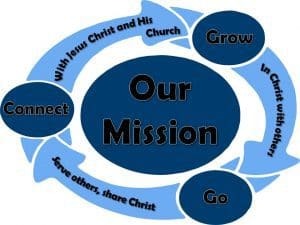 GO on mission as we serve together. Opportunities to serve in our church and community are plenty. It may be teaching a class, volunteering at the local food pantry, the Pregnancy Resource Center, a summer mission trip or a local mission project. When we are on the GO, this circle starts all over as we help others CONNECT AND GROW. We in the MGFBC family are all impacted by the life-changing power of the gospel and realize we must all CONNECT, GROW AND GO through worship, prayer, Bible study, and serving before we can impact our community, friends, and church with that same power!